Cardio Tennis will be starting again this coming Tuesday (4th October) at the indoor tennis centre, Rutland Sports Park. 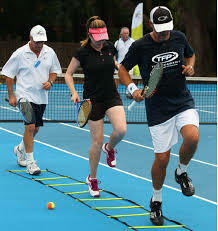 Cardio Tennis is a fun, sociable group fitness class set on a tennis court and open to people of all ages and abilities. Supported by music and qualified instructors, you’ll get to hit lots of tennis balls during your class and have a great cardio workout at the same time. The cost is just £5 for members and £6 for non-members, and runs from 6pm to 7pm. Subscribe here to receive updates!